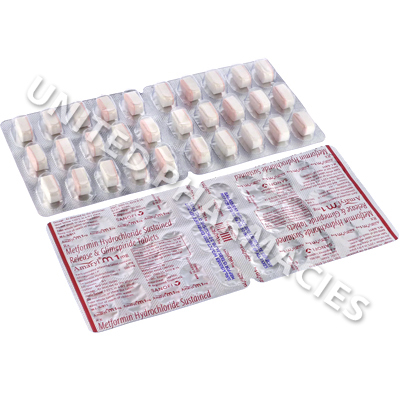 Amaryl M (Glimepiride/Metformin HCL) is an oral sulphonylurea medication prescribed to patients who are suffering from type 2 diabetes. It operates by stimulating the pancreas to increase the release of insulin helping to control elevated blood sugar levels. Amaryl M (Glimepiride/Metformin HCL) is an oral sulphonylurea medication prescribed to patients who are suffering from type 2 diabetes. It operates by stimulating the pancreas to increase the release of insulin helping to control elevated blood sugar levels. This is commonly prescribed along with a balanced diet and exercise to reduce the occurrence of symptoms such as fatigue, blurry vision, or confusion caused by hyperglycemia. In some cases, it may be prescribed for use alongside other diabetes drugs. Do not take more or less of this medication than directed by your physician. Amaryl M (Glimepiride/Metformin HCL) should be taken with breakfast or the first main meal. If you miss a dose, take it as soon as you remember. If it is almost time for the next dose, skip the one you missed and go back to your regular schedule. Do not take 2 doses at the same time. More common side effects may include: anemia and other blood disorders, blurred vision, diarrhea, dizziness, headache, itching, liver problems and jaundice, muscle weakness, nausea, sensitivity to light, skin rash and eruptions, stomach and intestinal pain, vomiting. Amaryl M (Glimepiride/Metformin HCL), like all oral antidiabetics, can result in hypoglycemia (low blood sugar). The risk of hypoglycemia can be increased by missed meals, alcohol, fever, injury, infection, surgery, excessive exercise, and the addition of other medications. To avoid hypoglycemia, closely follow the dietary and exercise regimen suggested by your physician. Symptoms of more severe low blood sugar may include: oma, disorientation, pale skin, seizures, shallow breathing. Ask your physician what steps you should take if you experience mild hypoglycemia. If symptoms of severe low blood sugar occur, contact your physician immediately; severe hypoglycemia is a medical emergency. Do not take Amaryl M (Glimepiride/Metformin HCL) to correct diabetic ketoacidosis (a life-threatening medical emergency caused by insufficient insulin and marked by excessive thirst, nausea, fatigue, and fruity breath). This condition should be treated with insulin. When taking Amaryl M (Glimepiride/Metformin HCL), you should check your blood and urine regularly for abnormally high sugar (glucose) levels. The effectiveness of any oral antidiabetic, including Amaryl M, may decrease with time. This may occur because of either a diminished responsiveness to the medication or a worsening of the diabetes. Always use Amaryl M (Glimepiride/Metformin HCL) as you have been prescribed by your doctor. Never self-medicate or change your dosage without first consulting your doctor. The correct dosage can vary depending on your health, medical history, and the severity of the condition being treated.